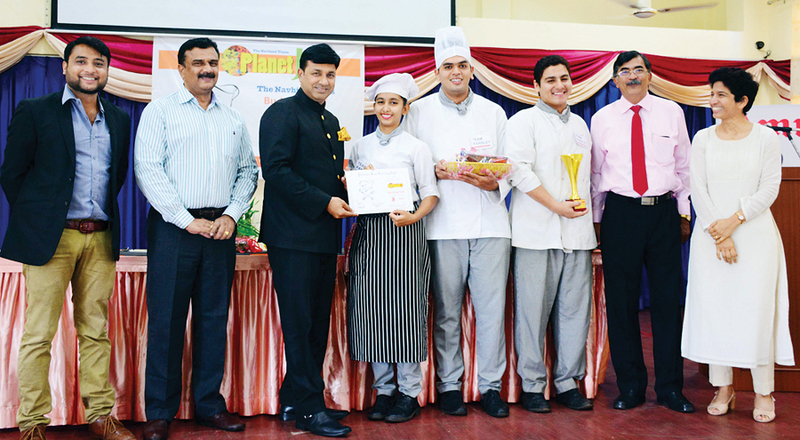 The Navhind Times culinary competition, Budding Chef 2017, in partnership with IHM Goa and Amul was held on January 13 at IHM Goa campus, Porvorim. Twelve culinary colleges and institutes from across the state participated in the maiden venture that was organised to challenge and test the culinary skills of Goa’s future chefs. Designed exclusively for culinary college students in Goa, the competition aimed to promote a culinary passion and taste for excellence in participants. Registration began at 9 a.m. and in keeping with the theme, teams were given names of herbs like basil, cilantro, chervil, chives, mint, marjoram, oregano, parsley, rosemary, sage, tarragon, and thyme. This was followed by a briefing by head of kitchen department, Lisa Norton Dias wherein rules and regulations and judging parameters were clearly explained. The excitement amongst participants was very palpable as they proceeded to the kitchen where they were given an individual tray with Amul products that had to be incorporated in their 3-course menu which included a starter, main course and dessert. There was also a common basket with additional Amul products, spices and oil. Participants began cooking at sharp 10 a.m. as they had just an hour and a half to prepare their three dishes. Some of the institutes had come a day prior to get their mise en place done and the competition started off with a buzz of activity. Each team comprising of two members and a helper worked in a planned and methodical way and their skills and team work came to the fore. With consistency and creativity contestants successfully achieved the dishes in the time allotted to them. Plating and presentation, for which half an hour was given, made the food even more appetising. Judges for the day were chef and owner of A Reverie restaurant, Aakritee; executive chef, Taj Exotica, Bhaskar Kargeti and executive sous chef, Grand Hyatt, Prasad Metrani. Besides allocating points for flavour, texture, consistency, doneness, creativity, menu and ingredient compatibility, portion size and nutritional balance, serving method and presentation, points were also given for sanitation, organisation, cooking techniques and execution, proper utilisation of ingredients, time management, garbage segregation and scullery or washing up. The three judges meticulously graded each dish while asking relevant questions to contestants and giving feedback and suggestions that students eagerly listened to. After a nail-biting waiting period, results were declared at the felicitation ceremony where chief guest was general manager of Taj Exotica, Vincent Ramos. Also present on the dais were general manager, the Navhind Times, Pramod Revankar; principal of IHM Goa, Donna D’Souza; Amul representative, Manish Bameta and IHM front office HOD, Sanjeev Katkade. Besides certificates and trophies from the Navhind Times and gift hampers from Amul, winners also got a free meal at the Taj Exotica and the overall winners a free night’s stay at the hotel which was magnanimously gifted by Ramos. “We are extremely happy that the competition has turned out so successfully and wish to make it an annual event,” said Revankar. It was extremely commendable to see the enthusiasm with which participants took part. Team work and creativity were evident in each team and every participant learnt something. The competition was a good platform for students to showcase their skills and creativity and in my opinion it was a win-win situation for all as every participant went home with something. The competition ignited the culinary passion and built the confidence of all participants. It was a great motivator for budding chefs and it was heartening to watch the team spirit as they worked to achieve a specific goal and worked with a positive attitude combined with innovation and creativity. Considering it was a maiden venture by the Navhind Times, it was remarkably well organised. Our students were keen on participating in the contest, since such opportunities immensely benefit them and also because it exposes them to talent that they will be competing with when they get into the industry. Well done! More of such initiatives are welcome. The organisation of the entire event was flawless and facilities provided by IHM were at par with international culinary competitions. Judging was very thorough and fair and the tips from the judges will go a long way. I hope Navhind Times makes this an annual event. Competitions bring out the best in people and sometimes history is created through the spirit of competition. It is platforms like these that train students for bigger and tougher challenges ahead. I would like to congratulate the organisers for their amazing skills and synchronised efforts put in to create such an excellent platform for young budding talent.